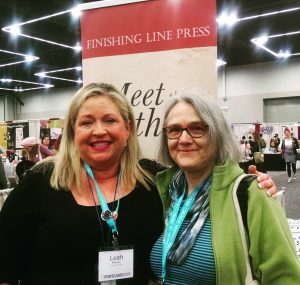 Leah Maines is the founder and editor at Finishing Line Press, she chose my chapbook manuscript in 2006, and my full size manuscript in 2016 to publish. She is a force for publishing many poets across the country. It was great to connect with her at the FLP reading on Wednesday night, hosted by Black Hat Books, then again at the Bookfair. Many thanks to Leah for her unwavering faith in my work. What a ride AWP was this year, it was my fifth time attending this huge conference where approximately 14,000 to 16,000 writers come together from across the country to network, learn from each other, and share new work. A few tidbits below of what I learned and the rich connections made. Anna Leahy, moderator, Beth Ann Fennelly, Paisley Rekdal and Cori Winrock were panelists. These writers had excellent tips for hybrid work including checking out the anthology: Family Resembalance: An Anthology & Exploration of Eight Hybrid Literary Genres by Marcela Sulak & Jacqueline Kolosovo; also the work of Kimika Hahn who uses a Loose Brush method. I went to several Readings & Tributes and learned for the first time that readings are designated in the booklet with an open book symbol! So on my fifth AWP I definitely learned something new! Radiance versus Ordinary Light: A Tribute to Carl Phillips. What a delight to hear him read his work and all the attributes to his fine teaching. See his picture to the right! From Which We Spring: A Tribute to Los Angeles Iconoclast Poet Wanda Coleman. Audre Lorde first introduced me to Wanda’s writing, she knew it would resonate with me. Wanda held a special place in my heart and I’m so glad I had the opportunity to meet her a few times when she came to the Northwest and to do two workshops with her. She was a prolific poet, fiction writer and essayist who wrote for television for years. I miss her in our world and am so glad they created the space to remember her. Patricia Smith replicated a reading Wanda did at Naropa to a nearly all white audience, that Patricia happened to attend. If you know Patricia Smith, she has the power to replicate such a moment in time, chills ran though me to imagine the setting and this rare opportunity of memory in action. Peter Elbow Tribute with Peter Elbow! He was one of my original inspirations before I went back to school for my undergraduate in creative writing. I didn’t even realize he was still alive. So many people spoke highly of him and gave him acknowlegement and praise for his work to help writers simply write. He is still doing good work and has an essay on belief versus doubt he read part of, it was indeed an inspiration to see him. 25 Years of Creative Nonfiction: An Anniversary Reading, with the man who started it all, Lee Gutkind. He told stories about starting the journal, the fear no would would be interested and the great reaction they had from the beginning. Turns out the journal had an ad in Vanity Fair, which had 1.1 Million readers and that readership loved the new discipline of creative nonfiction. I was excited to hear local writer Brenda Miller, along with Mimi Schwartz, Suzanne Roberts, Brian Broome, Beth Ann Fennelly, and Dinty Moore. The Coast is Queer: LGBTQ+ Voices from the Pacific Northwest, with friends Kate Gray and Carol Guess; this reading also introduced me to playright Romon Esquivel and Michael V. Smith, a poet and memoir writer. It was so good to hear each of them read and very moving to hear them address their writing and how it fits into the Northwest as a location. Carol Guess does a lot of collaborative work and this came up for discussion. Her reading to our group went the way of NW serial killers, and was refreshing in its perspective. Kate Gray’s new poetry book, For Every Girl, is out and arrived in the mail soon after I returned home, also I picked up Michael’s memoir, My Body is Yours, at the conference from his publisher, Arsenal Pulp Press. So many books to read! Taking It All Off with Camille Dungy, Kathryn Miles, Suzanne Roberts, Sholeh Wolpe and Erika Meitner talking about telling the truth and the dangers inherent, the risks for women. Healing Harm/Harming Heal: The Power and Pain in Writing Through Trauma with Diana Arterian, Tiana Clark, Vanessa Angelica Villarreal, and Natalie Elbert. All writers I now want to read, a very powerful panel that moved me incredibly. These young women are writing work while working through PTSD in a way that is aware and smart. The Resistance is Femme at Powell’s Bookstore on Friday night was a wallop of power with a reeved up audience! 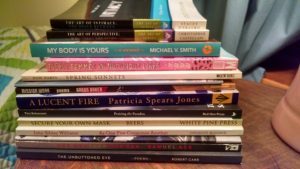 Starting with the Queen of Odes, Lauren K. Alleyne, then Ryka Aoki, Anastacia-Renee, Amanda Johnston, Denise Frohman, Ada Limon, and the amazing Patricia Smith. I’m so glad I did not miss this one. 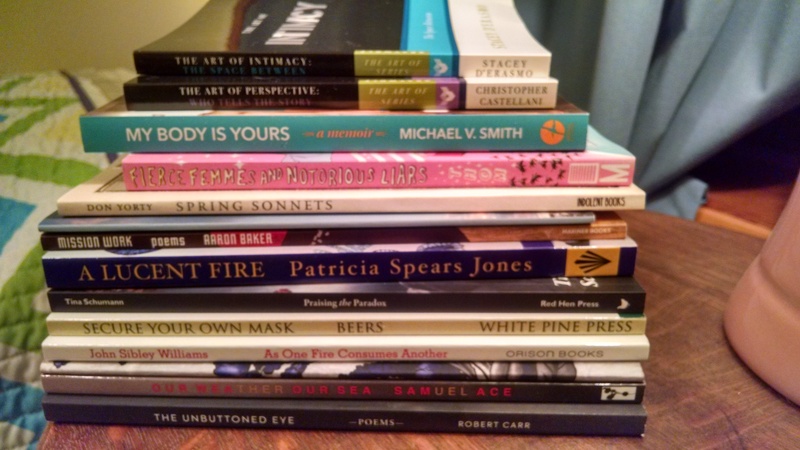 Commonplace’s Offsite Reading featured Rachel Zucker’s podcast interview readers, a few included: Jericho Brown, Morgan Parker, Tommy Pico, TC Tolbert, plus… we packed Passages Bookstore for over an hour and what a wonderful reading. Evening readings back at the Converntion Center! Jesmyn Ward and Michell S. Jackson, with Michell interviewed the National Book Award winner. 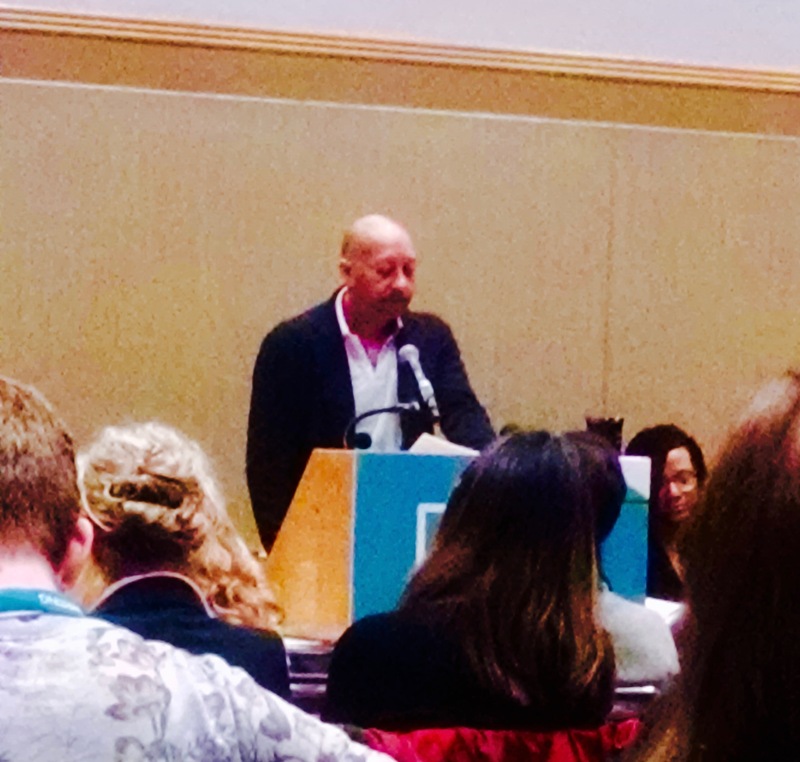 Toi Derricotte, Adrian Matejka, and Mai Der Van read their moving work. And there were so many friends I only see at AWP! The Panel, Celebrating 20 Years of the Oxford American Southern Music Issue featured my dear long-distance friend L. Lamar Wilson, along with Lauren Du Graf. I’m so glad I stepped into this group discussion, I learned about a journal that every year features a different state and obscure music from that state, plus I connected with Lamar. whose book Sacrilegion is a great read. It was fun to meet Facebook friends for the first time: Shaindel Beers, Carolyn Forche, and Camille Dungy. And friends I met at AWP and have bonded with such as Micheal Broder and Robert Carr to nurture our budding friendships. It was sad to miss meeting friends I knew from the past like Angela Trudell Vasquez, or to be in Portland and not have time to see friends who lived there. Or to go to the other two events that featured writers going on at the exact same time! A book fair, and an event at the Ace Hotel with books and readings. 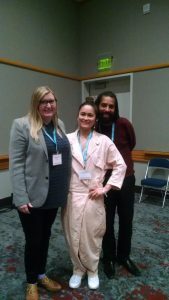 Two friends from Seattle came down to read at the Ace Hotel event, and I didn’t know about it till mid-way through AWP. Talk about overwhelm! Overall it was fun, energizing and exhausting at the same time! I can’t go every year and am grateful when it is close enough to make it doable to attend. 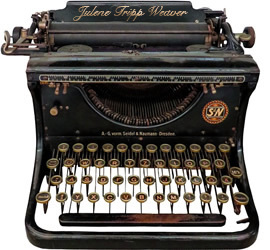 The great thing is I came back jazzed to write with lots of new ideas. And if I’ve forgotten anyone, please forgive me. Thank you for reading if you stayed with me this far! Next month I’ll be writing about the Mid-West Women’s Herbal Conference where I’ll be reading and running writing workshops around health and healing. 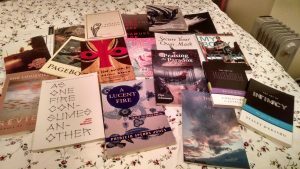 Previous PostFinishing Line Press Reading, 3/27, Off-Site AWP, Portland!